The FIRST ® Ultimate performs equipment independently. All owners will be really happy with their sound reproduction for the first time in their life. Also as a digital interlink, The FIRST ® Ultimate performs unsurpassed. The typical interface induced jitter-distortion is definitively finished. Available: 0.6, 0.8 and 1.0 meter, single packed (for digital audio interface applications (SPDIF)) and stereo pair packed with our RCA type connectors. The FIRST ® Ultimate is NOT available on reels for do-it-yourself purposes. Customising this cable really needs expertise. Resistance 20 °C / 68 °F: Core: ~36 Ohm/m. ; Screen: ~4.8 Ohm/m. Connector Types Suitable: Our RCA type C - 8.0. Remarks: Connectors need to be factory mounted. (*): For short distances only and exhibits an excellent impedance mismatch reflection damping. EQUINOX 8 RCA - Cable de interconexión analógico -- DISEÑO Tri DNA Helix. CONDUCTORES DE SEÑAL 3 (grupos de 12 filamentos) Calibre: 21AWG | 0,4 mm². MATERIAL CONDUCTOR OCC-7N Cobre. Aislamiento Composilex 3. CONTACTO CON LOS TAPONES Silver-clad OFC - Disponible en varias medidas. Versión no balanceada con conectores RCA bañados en rodio. 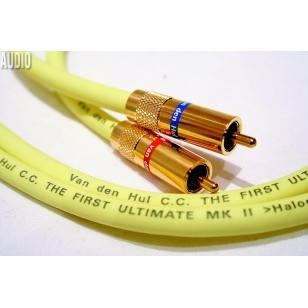 GOLD ECLIPSE 8 RCA - Cable de interconexión analógico -- DISEÑO Hélice Quad DNA. CONDUCTORES DE SEÑAL 4 (grupos de 16 hilos) Calibrador: 18AWG | 0,8 mm². MATERIAL DEL CONDUCTOR 4N Plata maciza. Aislamiento Composilex 3. CONTACTO CON LOS TAPONES Silver-clad OFC. NOTA GEI (RCA a RCA); GBI (XLR a XLR) - Disponible en varias medidas.